Pear flavor is a tart, and sweet pear flavoring. This flavor offers the savory sweetness of a newly picked fresh fruit taste. It is ideal for ice-creams, candies, dinks and more. Type: Peanut butter cup Water Soluble Flavoring. Ingredients: Natural and Artificial Flavoring, Propylene Glycol and Ethanol. USP Kosher Grade Flavoring. Usage Rate: 15-20% for E-use. Flavor Suitability: Suitable for drinks, beverages, cakes, desserts and pastries, cookies, ice-cream, pies, and more. Specific Gravity: 1.03 No Refunds on Flavoring. Very good pear flavor, especially when you mix with other fruits or cream types. Gives a blurry look when mixed, and taste is great. 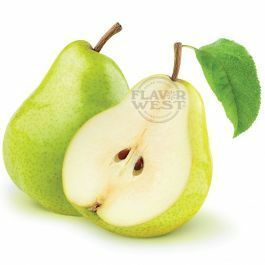 Flavor West's Pear is a GREAT Flavor for Vaping. It's very Fragrant but not perfumey at all. A good alternative to Apple and mixes well with Guava, Coconut, and Caramel Candy. If you're burned out on Peach, give Pear a try! You'll like it a lot!